Energy bites have become my new favorite snack – especially when eating on the run. They are easy to make and it’s fun to explore different combinations. 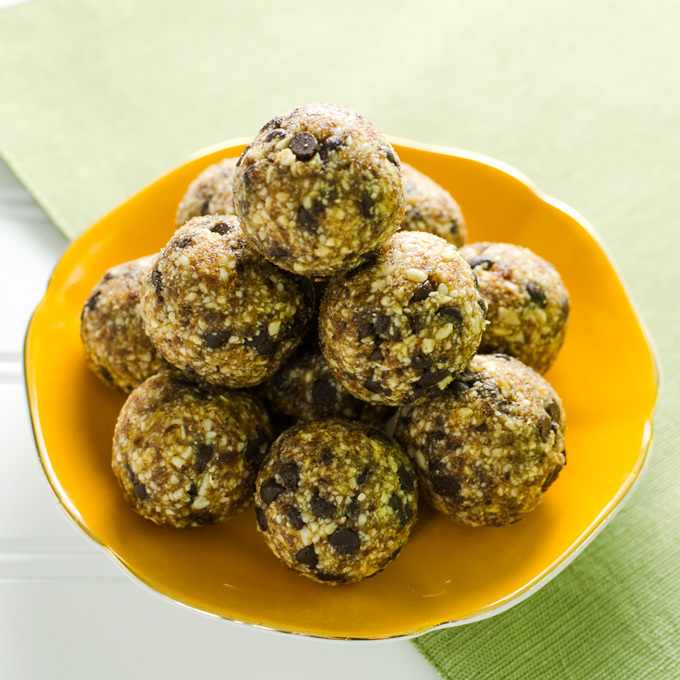 These cookie dough energy bites are inspired by Chocolate Chip Cookie Dough Larabars. The Amazon.com subscribe and save program is great, but we are looking to trim our grocery bill further. I decided to try my hand at homemade Larabars. Being a lazy cook, I figured why not skip the ordeal of forming the ingredients into bars and make energy bites instead! You simply add all the ingredients to a food processor and pulse to combine. 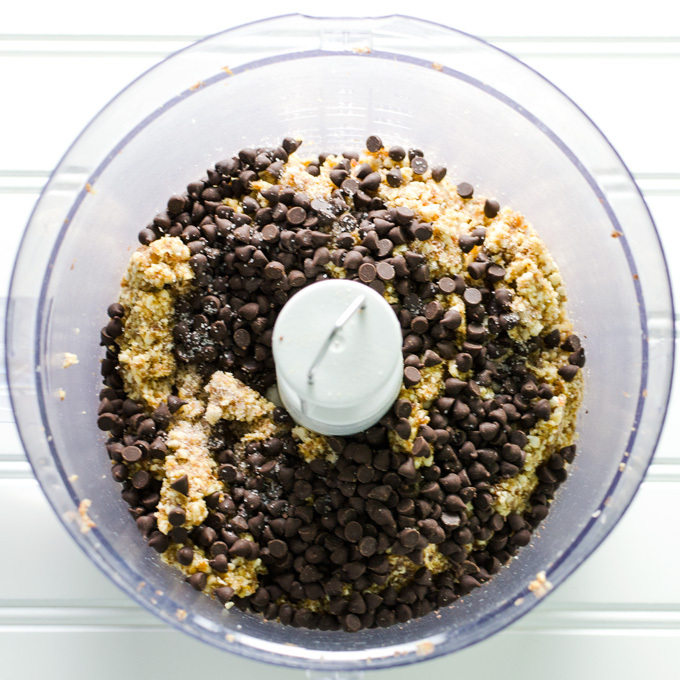 I prefer to add the chocolate chips after the other ingredients have been mixed so they remain mostly whole. 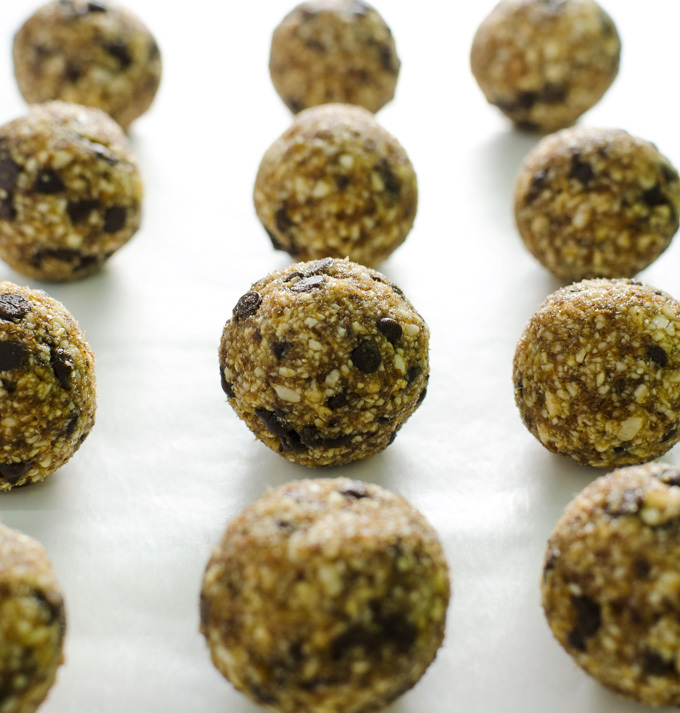 Forming the mix into balls instead of bars is a time-saver and allows greater portion control. Snacking on one or two cookie dough energy bites can be just as satisfying as eating an entire Larabar. Soak dates in warm water for approximately 10 minutes then drain. 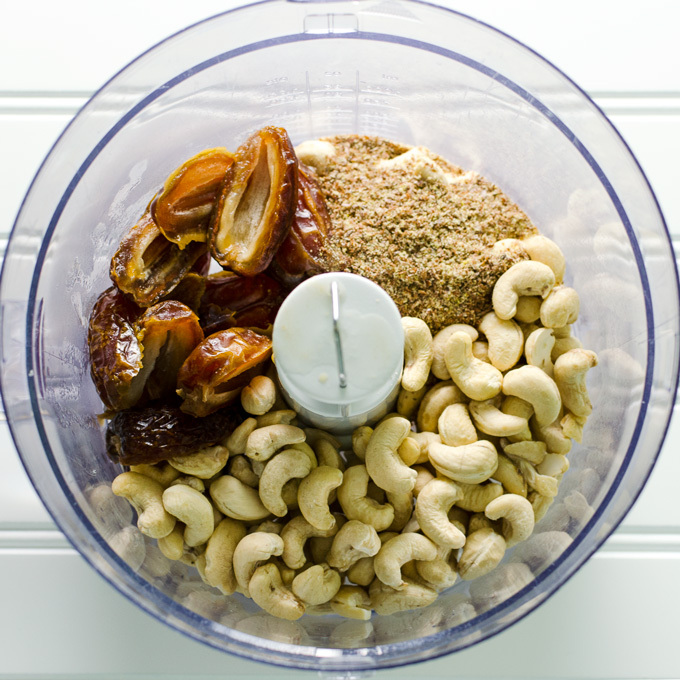 Add dates, cashews, ground flax seeds and sea salt to a food processor fitted with the S-blade and pulse until ingredients are well mixed and begin to clump. Add chocolate chips and pulse until well blended. Scrape ingredients into a mixing bowl and then form into walnut sized balls by scooping dough with a spoon and rolling it between your hands. Enjoy immediately or store in a sealed container in the fridge for up to a week. 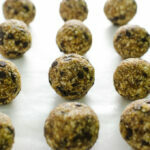 Recipe makes approximately 1 1/2 dozen energy bites. I use pre-ground flax seed in my recipes. If you grind your own flax seed you may wish to reduce the quantity. I'm told freshly ground flax seed may have a stronger flavor. I really like this recipe…but I know now to process the nuts some before I add everything, I still had too many chunks of nuts …LOL. I also add some cinnamon which made it taste even more like chocolate chip cookies. Thanks for the great healthy recipe! My daughter is ANA to cashews. Do you think another type of nut might work? Almonds maybe? Almonds might work – it would just alter the flavor a bit.